In July 2011 the study site showed a mix of colors. The photo was taken at about 12,000 feet at a test site near West Turkshead Peak just north of Molas Pass. It was during peak flowering, which normally occurs in July. In June 2012 the ground at the study site was dry and dusty. The photo was taken at about 12,000 feet at a test site near West Turkshead Peak just north of Molas Pass. It was taken during peak flowering, which normally occurs in July. 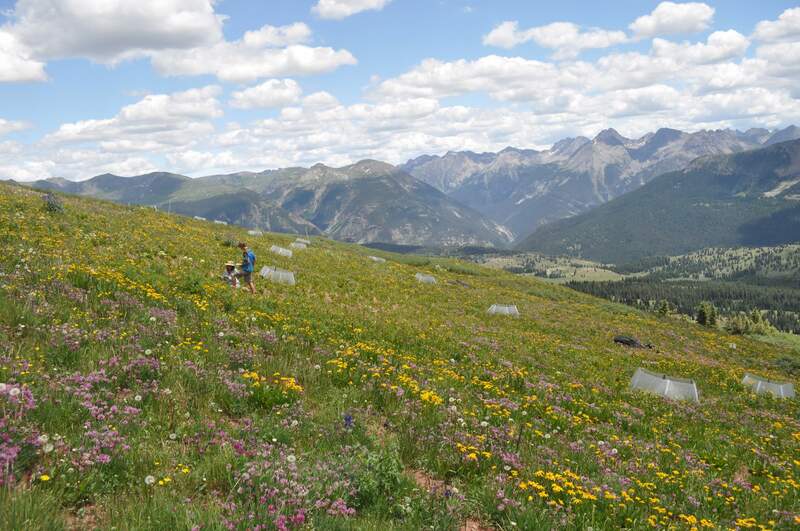 The effects of little snow and an early snowmelt on alpine flora at Molas Pass this summer possibly could signal what global warming holds for the San Juan Mountains, a Fort Lewis College professor says. Steltzer, a professor of biology, was summing up the presentation she made at a conference of the American Geophysical Union in San Francisco recently. The observations, comparing the summers of 2011 and 2012, were done in collaboration with faculty colleague Julie Korb, a biology professor, and FLC students and graduates. Grace Fullmer studied flower abundance, and said peak flowering occurred early and that flowers were scarce this year. She also found that warmer temperatures decreased flower abundance. Emily Cornell and Sarah Bangert studied soil, finding that nitrogen was in short supply. The West Turkshead study area, about 1.5 miles by trail from Little Molas Lake, is a meadow in the alpine tundra at 12,000 elevation where team members kept track of 32 plant species, including the sky pilot, alpine rock jasmine and alpine clover found only at high elevation. The elevation of West Turkshead contrasted with a companion study done at 9,500 feet elevation at the Rocky Mountain Biological Laboratory near Crested Butte. There. David Inouye, a professor at the University of Maryland, has been studying wildflowers in the same plots for 40 years. Inouye and Steltzer presented papers at the American Geophysical Union meeting and held a joint news conference. This year, Inouye found a low number of species, Steltzer said. Steltzer, Korb and the students studied flora in the natural setting near Molas Pass and created three other scenarios for comparison – an area covered with black fabric to absorb heat and hasten snowmelt; mini-greenhouses to heat earth and air by 2 degrees Celsius; and a combination of the two, first the fabric and then immediately the greenhouses. 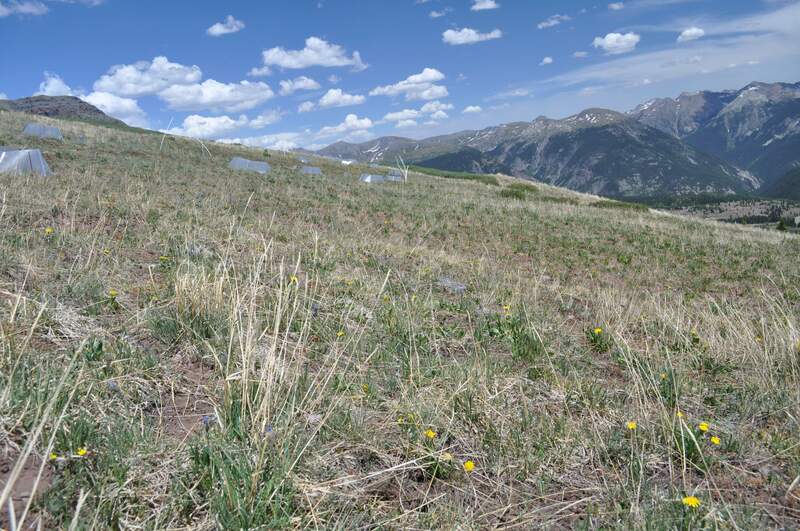 Snowmelt, commonly, is the cue for alpine plants to begin growth and produce flowers, which is about 10 and 20 days later, respectively, Steltzer said. But in 2012, the mean time for growth to begin was 20 to 45 days after snowmelt and flowering occurred 35 to 60 days later. “What we're seeing is that in the alpine species, plants seem to be more conservative than subalpine species,” Steltzer said. “They wait for other cues, likely temperature and day length, when snow melts early. Although early snowmelt did not cue spring-life events, it did have a significant effect on the appearance of the first brown leaves. There was an earlier senescence (die-off) and shorter life overall. “Since the alpine has long been characterized as an ecosystem in which late-melting snow limits the growing system, what we found was surprising,” Steltzer said. Many alpine plant species may have adapted to rapid growth and flowering and then a quick transition to dormancy, she said. “Just over half of the 32 species we monitored lost leaves in June and July in at least one of the plots, and nearly three-quarters lost their first leaf in that time period,” Steltzer said. “In response to warming in the mini-greenhouses, we found that spring events (growth and flowering) didn't occur significantly earlier, but leaf loss occurred earlier. If temperature is the cue, the warming produced in the greenhouses probably wasn't enough. “We'd like to better understand the environmental factors that cue plants in the alpine to begin and end growth in an unusual climate year,” Steltzer said. Chris Landry, head of the Silverton-based Center for Snow & Avalanche Studies, said Steltzer's finding this year were not unusual. In the Swamp Angel study area he monitors in Senator Beck Basin on Red Mountain Pass, there was 100 inches of snow on May 11, 2011, Landry said. On May 12, 2012, there was no snow, he said. A U.S. Bureau of Reclamation report in 2011 on water supply in the western United States found no consensus on the trend in water supply in the Upper Colorado River Basin. But they didn't have the benefit of the variability of the past two years, 2011 and 2012, Landry said. There was extreme variability in back-to-back years. Steltzer also does similar research in the Arctic on the north slope of Alaska's Brooks Range. She's visited there once or twice a summer for three years.